Yes. You read that right. I am not just trying to catch your attention with crazy false claims. You can have all of those things I listed together, in the same room, with joy and no fear, because of Revolution Performance Fabrics. First, watch this video of these 4th graders trying to throw shade. Then listen for us dropping the mic (its really hard to hear it but it happened) like a boss. Are you excited about this? Or are you thinking, "yeah, that's cool, but I don't know if this really matters to me... or how do I get this? Where do we start? Is it expensive?" I am glad you are starting to think about it now. You're still here, reading. You need to expect and demand more from your every day furniture. You should not be freaking out when crazy Aunt Lydia* is holding her red wine while she sits on the sofa and she likes to talk with her hands... A LOT. Or holding that sweet baby* who also happens to have projectile vomiting. **Fun fact: both of these are examples from my real life. Revolution Performance Fabrics are made right here in the good ole' USA. They are designed to combat all those things like wine, oil, pet issues, people issues, markers, etc. All without chemicals! Yes, you read that right. They are basically awesome and beautiful and every one should have these fabrics on their furniture. And did I mention the price point is phenomenal? Like you will be amazed. This is Revolution pattern, Avant Garde. It is so pretty. It is $14.95 per yard and you can purchase it here. Isn't that cool?! Now you are hanging with the cool kids. But wait… it gets better. You can buy Revolution fabric DIRECT from them! What? Seriously? Yup. You can shop on their online store by clicking here or of course you can get everything through us at JDuce Design. Did I mention I am a Revolution Design Ambassador (I'm actually really, really proud of that)? I can send samples, meet with you, hold your hand, I have a few specials I share, whatever you need. But if you’re shy or just don't want to spend time with us - you can also go direct to their website. No questions asked. See, I told you I have your back! We are in this together. You will love their fabrics and you can find it and use it and feel great about it! Here is one more video. I just love this one. It shows you how this wonderful family has created this beautiful company and it is all right here. If you made it this far, I am sooooo proud of you. Welcome to the club. Feel free to contact us with any questions. We would love to help you. A special girl got a big room make over right before Christmas! Zoe and her family live in San Diego, California and were the most recent recipients of an amazing room update by Savvy Giving by Design. Zoe is seven years old and was diagnosed with Stage 4 Neuroblastoma in February 2017. Zoe has undergone seven cycles of chemotherapy, a 10 hour resection surgery and completed her first stem cell transplant this past September. She is expected to complete her treatment in June 2019. Zoe is one of four children in her family, two boys and two girls. Zoe and her sister, Andrea, share a room that can now be called the “Unicorn Room.” Zoe and Andrea received a brand new bedroom, complete with Revolution Fabrics! Zoe and Andrea’s unicorn beds were made with Revolution Plus pattern, Slipcover Twill (color: white). The girls’ custom bedding was also made with Revolution. On one side of the comforter is Slipcover Twill and on the other is a decorative unicorn fabric! In true Savvy spirit, Zoe’s brothers’ room was also redone. Check out the photos and video below of Zoe and her siblings’ room reveals! NBC San Diego news station also featured Zoe’s family and Savvy in a recent segment that you can watch here. Revolution looks forward to support Savvy Giving in 2019! Zoe loves her new room! 2018 has been a great year for Revolution! We kicked it off with a brand new plant and ended it with a super successful Showtime. Check out some of the highlights of our year below. The Revolution family looks forward to working with our customers and colleagues in 2019! Revolution started 2018 off with a huge accomplishment… a whole new 150,000 square foot plant! The new plant houses more offices, looms and our shipping department. STI was a part of a photography project called Carolina Works that highlighted North Carolina manufacturing. Tim Coffey, the photographer behind Carolina Works, visited our mill in February and featured some of our valued employees in his photography project. When Revolution was created in February 2015, it was only available for sale to furniture manufacturers. That all changed in January 2017 when Revolution launched it's online store, revolutionfabricbytheyard.com and began selling to the trade. Revolution attended and sponsored their first Design Bloggers Conference in 2018 and it was a huge success! High Point Furniture Market is a twice a year event that allows us the opportunity to see our customers and Revolution on their furniture! Revolution Design Ambassador, Cheryl Luckett (owner of Dwell by Cheryl) was asked to participate in a huge makeover at a historic home in Greensboro, North Carolina known as the Julian Price House. The Julian Price house not only received a major update, but it was sponsored by Southern Home magazine as a Showhouse. Cheryl used Revolution fabrics in multiple applications in the master bedroom and dressing room! At ITA Showtime in June 2018, we introduced Revolution Chenille and Revolution Outdoor to our customers. The soft hand of the chenille and durability of Revolution Outdoor was a big hit with our customers! Every Summer, STI hosts a picnic to welcome their employees back from the 4th of July vacation and to thank them for all their hard work! This past Summer’s picnic was great as usual, but it did get a little electric! Read “STI Summer Picnic 2018” for a full recap of the event. STI has been in continuous operation since 1964, but what is the history behind textiles and the mills that weave them? Todd Lavender, a designer at STI, provided us with some great insight into how textiles began in the United States. Read Todd’s blog, “The History of Textiles” to learn more! Savvy Giving is an amazing non-profit organization that updates and designs rooms for children facing a medical crisis. Revolution has been a proud supporter of Savvy Giving since late 2017. Savvy has an annual fundraiser every year that raises money and awareness for the organization. Revolution was happy to attend and sponsor the event! The most recent HPMKT had more action with the design industry than it had in years past. Revolution was featured in ITA’s ‘Performance Fabric Playground’ and Cheryl Luckett launched her new furniture collection which included Revolution! Read “High Point Furniture Market, Fall 2018” for a full recap. 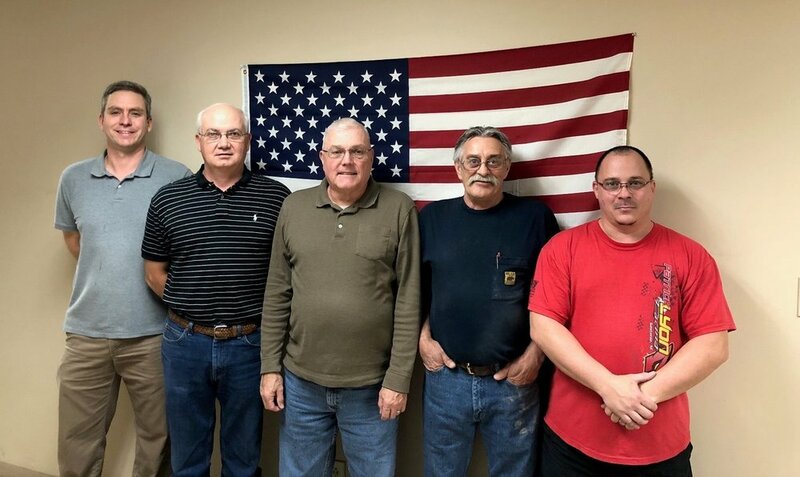 STI is proud to have multiple veterans employed at our mill in King’s Mountain, North Carolina. Every Veteran’s Day we look forward to honoring our veterans with recognition and a great appreciation. The first week of December, STI and it’s affiliate companies showcased their new fabric collections. Revolution Outdoor, Revolution Plus and a new Revolution Artisan collections made a big impact! As the year is drawing to an end, I look forward to the year ahead. That’s the way the design process works ... always planning ahead. We just had Showtime which is when we show our line in High Point to our customers. Good information can be gained from crunching the numbers to see how many times each pattern was requested and process feedback from customers. With that information, it is time to look ahead and start planning for the next line. I tell my daughter who is learning to drive “look ahead” and “be aware of what is happening in front of you,” … it is the same in design! We have to look ahead and plan for the future. We start our planning by tearing out ideas from magazines and printing inspiration we find online. Shopping in clothing stores can provide useful pattern and color direction, I even watch the design shows on television. From the inspiration pieces, we begin to create groups whether it be contemporary, a twist of traditional, the trending “farmhouse” look or other trends. It is refreshing to have a new line at the beginning of the year. I hope everyone is looking ahead to the New Year with great anticipation. The influence of textile mills in the early part of the 1900’s was far reaching, often including their own pharmacies, movie theaters, restaurants, and even houses of worship. Long before the mega-malls and strip mall stores, many rural textile mills had their own department stores which served the needs of mill workers, their families, and other members of the community. An early headline in the Forest City Courier of Rutherford County in western North Carolina read "The Cliffside Mills Store is Largest--Rutherford County’s Largest Department Store, with a Top Quality Stock At Rock Bottom Prices." The article goes on to read "The store is the largest and finest department store in the entire county, carrying only the best in all lines of merchandise and catering to the whole family and the home and making an outstanding specialty of rock bottom prices." Rural areas like Rutherford County experienced limited means of transportation, often consisting of horse and wagon, or a rare few early automobiles. This kept travel to a minimum and driving to a neighboring county to shop for goods was unheard of. The success of the small towns surrounding the mills grew with the success of the mill itself. What was only a small crossroads some 25 years earlier had sprung into rapidly growing towns with many amenities only dreamed of a few short years before. Just as many of these towns flourished with the success of textiles, in more recent years they have faded into memories due to the closing of so many textile companies throughout the southern states. All that remains is a whisper from the past--empty buildings casting shadows over lonely streets. While the number of textile mills remains drastically less than the number 25 years ago, STI is one of the few companies that has continued to grow. Having a yarn supply chain within the borders of the continental United States, STI has strategically placed itself in a position to experience continued growth while offering a product truly made in America. It is often said "To forget our history, we are doomed to repeat it." We must learn from our mistakes of the past, and move forward with new knowledge. STI’s Yarn Supply Chain - Revolution is 100% made in the United States! Living at the beach is a dream many of us share. While residing at the beach full time may not happen this year, you can create a casual, tranquil, beach vibe by decorating your home. Revolution Plus patterns Seastar Bottle, Slipcover Twill Bottle and Geometrics Citrus. Shop Revolution Plus here. Simple color palettes release your inner beachcomber. Use tranquil hues of light blue to navy to evoke the ocean and sky. Shades of beige, white, and khaki bring back the experience of sand dunes. If you need a bit of color, choose one, such as coral, and use a variety of shades vs introducing several different colors. Considered aged or sun-bleached paint surfaces for furnishings. Imagine furnishing with a reclaimed appearance or pieces that appear like you rescued that has washed up on shore. Beach décor demands durable furniture and casual fabrics. The beach invites us to come as we are with wet hair and sand covered bodies. You would never put sandy feet on a velvet sofa. Think instead of durable, washable fabrics. A slipcover may be a great solution for a carefree lifestyle. Floaty sheer curtains that catch the breeze and let in light add to the seashore experience. Use a solid color for most of your upholstered furniture. Tailored stripes also look amazing. As for furniture choose pieces that seem like they can weather any storm. Wicker is also a nice accent to any room and gives an instant weathered look. Toss a couple of nautical theme accent pillows on the couch or upholster an accent chair with a whale pattern. Introduce organic materials. Natural light will remind you of lounging in a beach chair listening to the ocean on a sunny day. A sweetgrass woven basket or a cotton rug would add texture any room. Add your shell collection or a piece of driftwood to complete the look. I believe the important thing in while decorating your house is to create the mood of the beach with color, comfort, and simplicity. This season’s Showtime of course included plenty of new patterns from Revolution, Revolution Plus and Revolution Outdoor, but also an introduction to a new cut yardage program and a partnership with Crest Leather. Our customers were overly pleased with all the new collections and initiatives we are offering. Learn more below! The Revolution design and production teams developed a new warp system that allowed us to create a collection of patterns that have a very natural, cotton, dry appearance. Since Revolution is made with 100% polypropylene, some patterns can appear to have a light sheen or sparkle to them. The Artisan Collection has 15 different patterns that are “de-lustered” and have a soft hand with an organic look. Revolution Plus is machine washable and the perfect choice for slipcovers, drapery, pillows or upholstery! To learn more about Revolution Plus, click here. Revolution Plus patterns Pagoda, Ginger Jar, Ginger Blossom and more on display in reds, blacks and whites! In addition to pattern Rumba, Revolution has launched new outdoor solid patterns, stripes and jacquards. Revolution Outdoor has 1,500 hours of lightfastness and the textures bring a sense of high end interiors to the outside. To learn more about Revolution Outdoor, click here. STI has partnered with Crest Leather to provide a quality, experienced leather supplier to our customers. Crest is a global producer of high quality upholstery leather for contract, residential, hospitality and design applications. Crest has an international headquarters in London and tanneries in Italy, Brazil and Thailand. To learn more about Crest, please visit their website here. Revolution - 100% Made in the USA! There are many, many brands that manufacture their product in the United States, but how many brands can say they make AND source their ENTIRE product in the USA? Revolution can! We wanted our customers to know that our product is 100% domestic. To accomplish this, we made a map showing where all our polypropylene and yarns are sourced from in relation to our mill in North Carolina. Revolution sales rep, Katherine Shoaf, showing a customer where Revolution comes from! Revolution has been selling cut yardage to the trade and end consumers through their online store, revolutionfabricbytheyard.com, for a little over two years. Now, that same program will be offered to furniture manufacturers who want to purchase smaller quantities with a faster delivery. To inquire about this program, please email revolution@stikp.com. Revolution is proud to work with an amazing team of design ambassadors that help elevate the Revolution brand and trade program. We were excited to have three of our design ambassadors visit us at Showtime! Cheryl Luckett (Dwell by Cheryl), Jessica Duce (JDuce Design) and Natalie Reddell (Commander in Chic) came to see the new Revolution collections and choose patterns for Revolution’s online store. Designer’s Today interviewed both Jessica and Cheryl about their ambassador roles, how they use Revolution in their projects and what is new in their own design businesses! Editor of Designers Today, Jane Dagmi, interviewed both of the ladies in the beautiful Brentwood Textiles showroom. Stay tuned to watch these interviews soon! Americans love their pets! Last year an estimated $69.4 billion was spent on our pets which includes veterinary care, food, medicine, grooming, and toys. In 2010 we spent $220 million for pet costumes at Halloween. That number has more than doubled this year to $480 million to adorn our little pumpkins, hot dogs, and bumblebees (top 3 pet Halloween costumes). There are close to 90 million dogs in the United States which have homes in 60.2 million households. Although there are slightly more cats in the country, however, more households have dogs. Dogs may be considered mankind’s best friend because they were the first animal to be domesticated over 15,000 years ago. It was a symbiotic relationship for man and dog (originally a wolf). Man benefited from the dog as a hunting companion and a means of warmth; the dog ate scraps from the hunt and perhaps gained some protection. Biscuit with his Revolution bed and pillow. Revolution has another dog pattern, Woof, available here. What do dogs have to do with fabric? Because of our love for dogs, we offered a dog pattern in our line at Showtime in High Point this week… it was a hit! The fabric is a traditional paisley with dogs. We offered the paisley with and without the dog pattern so the fabrics can be alternated on sofa pillows. The name of the fabric is Biscuit after my dog. Biscuit was rescued from an animal shelter as an adult dog and has been a faithful companion to our family for 11 years. Keith and Kevin Koenig in front of a Waterbed City in the 1970’s. Keith and Kevin Koenig are two brothers who know business! In 1971, Kevin opened a waterbed store in the basement of a house that he eventually grew into a small business called Waterbed City in Fort Lauderdale, Florida. Kevin sold $29.95 king size waterbeds by day and cut frames in the back of his shop at night. Keith officially joined his brother as a partner in Waterbed City in 1975 after graduating from the University of Florida. Along with Garry Ikola (current VP of Sales for City Furniture), Mike Lennon (now retired after 37 years with the company) and Steve Wilder (current CFO/CIO of City Furniture), they grew the business throughout the 1970’s and 1980’s. Waterbeds became increasingly popular during this time and more Waterbed City locations opened throughout southern Florida. However, in 1989 water bed sales started to decline and over the next few years, the team began evolving the business. In 1994, City Furniture opened their very first showroom in North Miami. In 1995, all Waterbed City locations were converted to City Furniture stores and 20 years later, City Furniture is now the #1 furniture retailer in South Florida. City Furniture employs over 1,300 associates who help grow their business and provide excellent customer service every day. Continuing to evolve their business, Kevin and Keith built the Kevin Charles Fine Upholstery factory in Mississippi and opened Ashley Furniture Home Stores in South Florida. Style, quality and value are at the core of everything they do to this day. Just a few of the beautiful sofas City Furniture manufactures with Revolution fabrics! In addition to making great furniture, City Furniture is very environmentally mindful and may be the “greenest” furniture company in the United States and throughout the world. They have built six LEED (Leadership in Energy & Environmental Design) Certified City Furniture and Ashley Furniture HomeStore showrooms, more than any other retailer. Over 95 percent of their waste is recycled, including cardboard, paper, plastic, and EPS/Styrofoam. Kevin Charles sofas and sectionals feature bio-degradable soy-based cushions. Revolution is proud to provide fabric to this upstanding family owned company that sets a high standard and example for furniture retailers everywhere. “Keith Koenig and City Furniture have supported STI for many years, and City was one of the first top 100 retailers to embrace the Revolution Performance Fabric brand, which has been a huge success for both companies. We’re truly honored to have such a close relationship with such an innovative and growing retailer,” says Sean Gibbons, CEO of STI. To learn more about City Furniture, please watch the video below. How to Choose Upholstery Fabric for Your Sofa! It’s time to change the look of your sofa. You’ve made the decision to reupholster your couch, but what should you consider when selecting a fabric? Look for the number of rubs competed on the abrasion test. A fabric should be 15,000 or higher for residential use. Woven fabrics last longer than prints. A neutral sofa with pops of color in the pillows and rugs. Fabric: Revolution pattern, Barkcloth Linen. Shop it here! Bold colors are exciting. Trendy colors are fashionable. But should you upholster your couch in either of these colors? You are free to do as you wish, but consider a neutral fabric instead. You can quickly change a look of a room with splashes of color on curtains, rugs, and pillows. It is much more difficult to change the color of your entire sofa if that trending color starts to look dated. Colors can also create a mood or solve a problem. A solid lighter color of fabric seem inviting and airy. A darker color may hide dirt. Consider the style of your sofa frame before selecting a fabric. For example, a traditional sofa frame will automatically look good with a traditional fabric. Textiles come in thousands of styles. Fabrics can look casual, ornate, formal, or fun. Consider whether your choice will fit into your current decor. If you choose a fabric with a pattern, pay attention to the scale. A large scale pattern may be overpowering in a small room or may not center on your sofa in a pleasing manner. The opposite may be true with a small pattern in a large room. Revolution and Revolution Plus has 500+ hours of lightfastness, making it the perfect choice for a sunny spot in your home! This chair is Revolution Plus pattern Slipcover Twill in color, bottle. Shop it here! Fade resistance: This would be important if your couch is in a room that gets a lot of sun. Mildew: Look for mildew resistant fabric in areas that have high humidity. Allergies: Microfiber is beneficial for some allergies because it is lint free and doesn’t attract dust. These are just things to think about. In the end, your home is an expression of you. Relax and trust yourself. You will make the best decision for you and your family. The term Chinoiserie, derived from the French word Chinois or Chinese, is the European interpretation of Chinese or Asian culture into decorative arts. This can be architecture, landscape design, furniture, wallpaper, textiles, porcelains, etc. It is first related to the Rococo style which began in France during the reign of Louis XV and is highly ornamental with a theatrical style of decoration. Chinoiserie became popular during the 18th century because Europeans had a fascination with the exotic Far East. Few Europeans had traveled to Eastern Asia which lead to the mystique although trade with China and East Asia was increasing. Imports of Chinese porcelain, lacquer, and textiles along with the perception of what typical life was like in Asia inspired artisans throughout Europe to created products with Chinoiserie motifs. Like many styles, Chinoiserie popularity has and ebb and flow. It seems the classic style is in fashion as traditional blue and white porcelain was important at the furniture market this fall and was featured in almost every showroom. Chinoiserie works well in traditional décor as well as contemporary if use sparingly. At Showtime in December we will introduce a few Chinoiserie inspired patterns.